note: uk releases came in company sleeves only. The collection shows picture sleeves from non-uk releases. 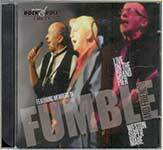 Live Concert, Fumble plus guest musicians. 24 songs, old classics plus new material.